Congratulations–you’ve found a buyer for your house–it’s a young couple with a growing family, they’re in an apartment they can’t wait to leave, and it’s good times all around. So you’ve made an offer on another home, called the movers, and are packing and purging and decorating the new house in your head. A week before you’re supposed to close, what could go wrong? One homeowner was in that exact situation–living among boxes with paper products and the microwave–three days before closing–when the buyer’s financing fell through and they weren’t able to get the loan. They had ignored the lender’s warnings not to use their credit cards or make any large purchases until after they closed, and had bought a new car two weeks before they were scheduled to settle on the new house. When the lender ran an updated credit report right before they signed off to have the documents printed, the buyers couldn’t qualify for the loan. And since they couldn’t get financing and that was a condition of the contract, they got their earnest money back. 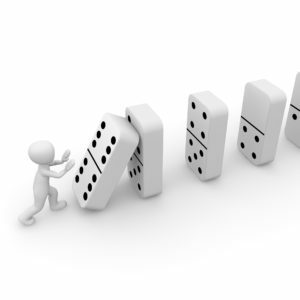 They not only left the seller high and dry, but since real estate is like dominoes, when that transaction fell apart it created a chain reaction of terminated contracts. Seller’s Advantage offers a new way to sell your house, without the frustrating waiting to find out if the sale actually happens. We’ll give you a free, no-obligation quote for your house, and since we pay cash, can have the sale finalized within a couple of weeks. Contact us and you’ll have peace of mind, knowing your house is really sold.